Travertine is one of the most durable building materials commonly used as flooring and wall cladding. However, it is ideal for a range of outdoor applications, too. Travertine pavers are especially designed for external use, like on driveways, patios, decks, walkways, and sidewalks. They come in different patterns, colors, and finishes to suit every application. When used on sidewalks, travertine pavers can add a sophisticated and elegant touch to your home’s exterior, while increasing the value of your property. The material lets you create a myriad of travertine pattern designs based on the color and texture of the pavers or how you install them. For an artistic touch on your sidewalk, go for French travertine pattern pavers. Also known as the ‘Versailles pattern’, ‘Ashlar pattern’, or ‘Roman pattern’, French pattern travertine pavers give a luxurious and classy look to outdoor paved areas of your property. Working with a reputable and experienced natural stone supplier gives you access to premium grade travertine pavers in a French pattern, and reliable assistance to help you create the right pattern of interlocking pavers to boost your property’s appeal. Travertine pavers are made from natural stone, which is imported by suppliers directly from top sellers and quarries in Asia, Europe, and Turkey. The nature of the stone lets you create a one-of-a-kind and bold style for your sidewalk. At the same time, you can be sure that your sidewalk will be safer for walking. Tumbled French pattern travertine paver offer extra grip for the feet to prevent slips and falls. French pattern pavers consist of four sizes: 8×8, 8×16, 16×16, and 16×24 inches. 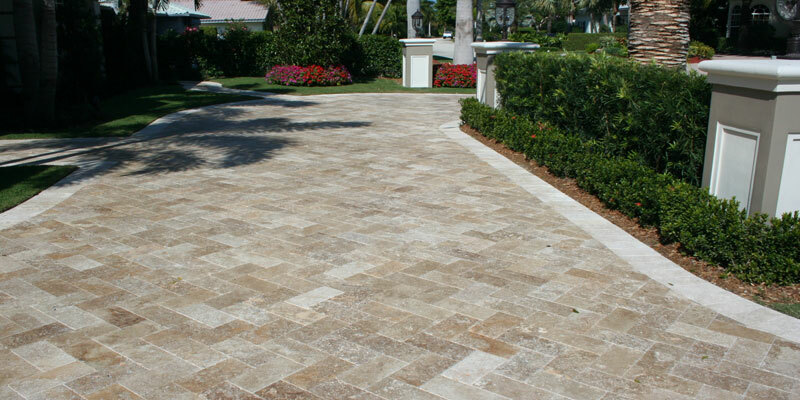 The way they are installed breaks the monotony that is commonly seen on solid and straightedge pavers. Hence, these travertine pavers can easily make your sidewalk look chic and more inviting to guests. They can make your home look more appealing to neighbors, too, so you can leave a good impression of yourself as a homeowner who has good taste.